While there are tons of speakers on the market, few actually deliver upon their promises of heart-pounding bass—especially if we're talking portable devices. The Boombotix Boombot Bass Station bucks that trend, delivering a deep, resonant bassline while doubling as a portable speaker. Now's the time to buy: it's currently over 80% off for a limited time only. This innovative device consists of two harmonized speakers that combine to produce some serious sound. 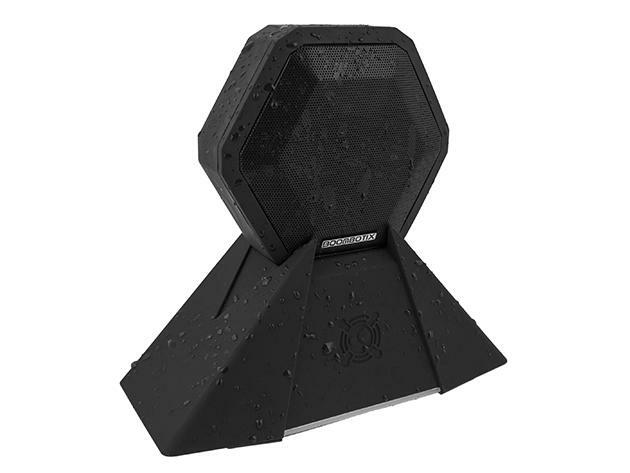 Use the Boombot Pro+ speaker as an ultra-portable audio device, or lodge it into the Bass Station (the companion 15W subwoofer deck) for some extra rich bass. You'll get up to 94 dB of sound so that you can hear each note in every song more crisply than you'd thought possible. Don't have your mobile device on you? Just back up some songs locally on the included 2GB flash drive, perfect for crafting the ultimate on-the-go playlist. You can even take this speaker to the beach or pool without a care, thanks to its IPX7 water resistance rating (meaning it'll survive a drop up to three feet into water). Oh, and if you don't feel like pushing a bunch of buttons, just control the Boombotix using Siri or Google Voice. Grab this seriously powerful speaker for just $27.95, marked down from the regular $149.99 for a limited time only.